If your course uses a Learning Management System (like Blackboard or Canvas), you will access alta through the links in your LMS environment. Check out this article for more information. If no LMS is being used in your course, continue reading! To access your course, you will need the knerd link provided by your instructor. Additionally, if you have been given or instructed to purchase an access code from your campus bookstore, make sure to have that handy! 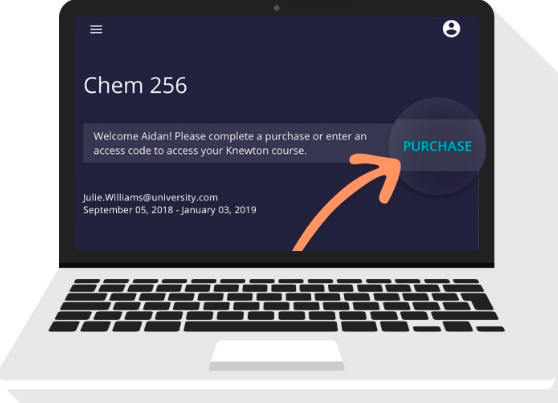 If you have not been instructed to obtain an access code, you will be able to access your course by purchasing a subscription after using your knerd link. Begin by clicking on your knerd link or entering it into your URL address box. Fill out the fields on the following screen to create your account. Remember to use your school email address! At the top of the next screen you’ll see a bar prompting you to purchase or enter an access code. Click Purchase. Don’t worry - you will not be charged for anything yet! If you have an access code, click Enter Code. If you do not have an access code, click Select Plan under one of the two subscription options. After you have entered your access code or paid for your subscription, you will be able to begin working in your course! If you are still waiting on financial aid, you can take advantage of our 14-day courtesy access option. Please Note: Each of these options applies to one alta course. If you are taking courses that use different alta ISBNs, or if you’ve used alta before and are starting a new course, you will need to purchase access again. Reach out to our support team if you need help!